The ear is another extraordinary organ of the house of wonders, that is, the human body. The ear catches sound waves and converts it into impulses, that the brain interprets, making it understandable and helps the human body differentiate between different sounds. The ear captures sound and helps you recall that sound throughout your life. The ear helps the body respond emotionally, according to the sound heard, like emotions of love on hearing the sound of a loved one, emotions of fear on hearing a threat or a gunshot! The sense of hearing with the help of cartilaginous pair of ears. From the sweet chirping of the birds to the irritating sounds of crickets, the loud bang of crackers and the beautiful symphony of an orchestra, all these different sounds and many other sounds are possible to comprehend due to our ears. Majority of the human population is born with fully developed external and internal ears. Even a fetus inside its mother's womb is able to hear all the sounds that are loud. Are you wondering how the human ear functions? What are the parts and functions of the ear? Well, let us begin understanding the hearing mechanism by knowing more about the different parts and functions of the ear. Outer ear is divided into the pinna and the external auditory meatus. The pinna, also known as the auricle is the external ear part that is located and seen on each side of our head. It is made up of cartilage and soft tissue. This helps in maintaining a particular ear shape and remains pliable. The pinna is like a funnel that collects the sound vibrations from around us and funnels them towards the external auditory meatus. 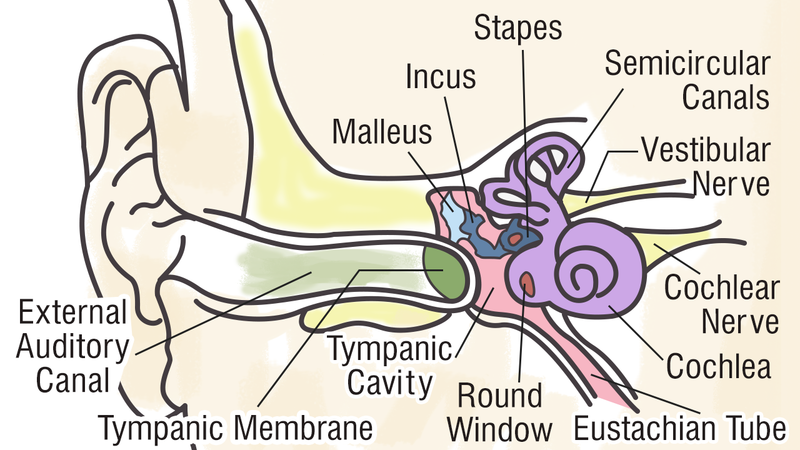 The external auditory meatus is also called the ear canal. The ear canal helps understand and determine the source and direction of the sound. It is only ¼ inch in diameter and extends from the pinna to the tympanic membrane. The tympanic membrane is commonly called the eardrum. Skin and hair cover the outer ear canal foundation and the cerumen gland or the wax gland is present in this area. The ear canal develops into a bony structure tightly covered by skin, near the eardrum. The eardrum is an extremely sensitive organ. It can detect the sounds with an intensity range of approximately 100,000,000 to 1. When the softest sound hits the eardrum, it moves about one-millionth of an inch and this vibration is transferred to the inner ear for further processing within the brain. The middle ear is the structure that begins at the end of the tympanic membrane. There are three tiny bones known as the ossicles that make up the middle ear. These bones connect the eardrum to the inner ear. Sound waves funneled in through the pinna, hit the eardrum. This causes the eardrum to move back and forth, in other words, vibrate, causing the ossicles to move. This causes the sound waves to convert into mechanical vibration. The three tiny bones forming the ossicles are malleus, incus and stapes. The malleus also known as the hammer is connected to the eardrum on one side and the incus, known as the anvil on the other side. The anvil is connected to the third bone stapes, also called the stirrup. The sound waves converted into mechanical energy are transferred through this ossicular chain. There is an in and out movement at the stirrup base known as the stapes footplate, that matches the incoming sound waves. The beginning of the inner ear is marked by the oval window that fits in the stapes footplate. The middle ear is present in the mastoid section of the temporal bone. The temporal bone is the skull bone that is present on each side of the head that is filled with air. The Eustachian tube runs from the middle ear front wall to the back of the nose and nasopharynx, that is, throat. The function of the ear tube, that is the Eustachian tube is, to provide ventilation and access to the external air and balance the air pressure on both sides of the eardrum. When there is a change in air pressure in our ears, we can chew, swallow and even yawn. The inner ear houses the sensory organs that help in hearing and maintaining balance. 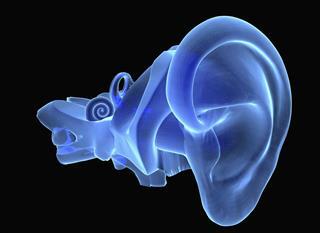 The part of human ear involved in the function of hearing is the cochlea. Another major function of the human ear is to maintain balance of the body. 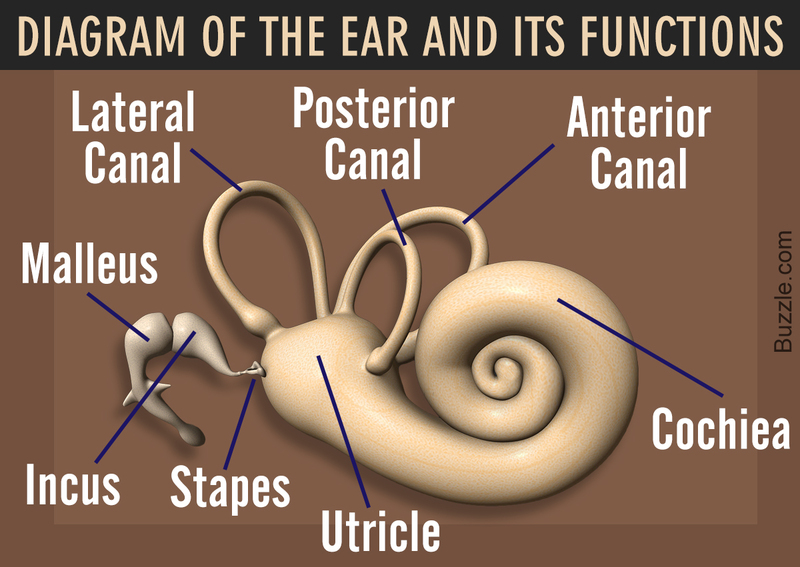 The different parts of the human ear that help in balancing are the semicircular canals consisting of the utricle and the saccule present in the inner ear. The bony structure that is shaped like a snail and filled with endolymph and perilymph fluid is called the cochlea. The sensory receptor called the Organ of Corti is present inside the cochlea. It has hair cells and nerve receptors, required for hearing. The middle ear movement pushes the mechanical energy in the oval window inside the cochlea. The tiny hair cells are stimulated due to the force that moves the fluids inside the cochlea. Pitches or the specific sound frequencies stimulate specific individual hair cells in the inner ear. Thus, certain frequencies are responded by certain hair cells. The hair cells translate signals into nerve impulses. The cochlear portion of the VIII cranial nerve, the acoustic nerve, transmits the nerve impulses to the brain. The acoustic nerve is the part of human ear that transmits impulses from the cochlea to the mid brain region, the cochlear nucleus, and further on to other pathways in the brain, that end in the auditory cortex of the brain. The nerve fibers of each ear are divided into two pathways from the cochlear nucleus. Of these two pathways, one ascends towards the auditory cortex in one hemisphere of the brain and the other crosses over and ascends to the other hemisphere of the brain. Thus, the function of the human ear nerve fibers pathway is to transmit data or information received from both ears to both the hemispheres of the brain. We have understood the different parts of a human ear and got an overview of their functions. 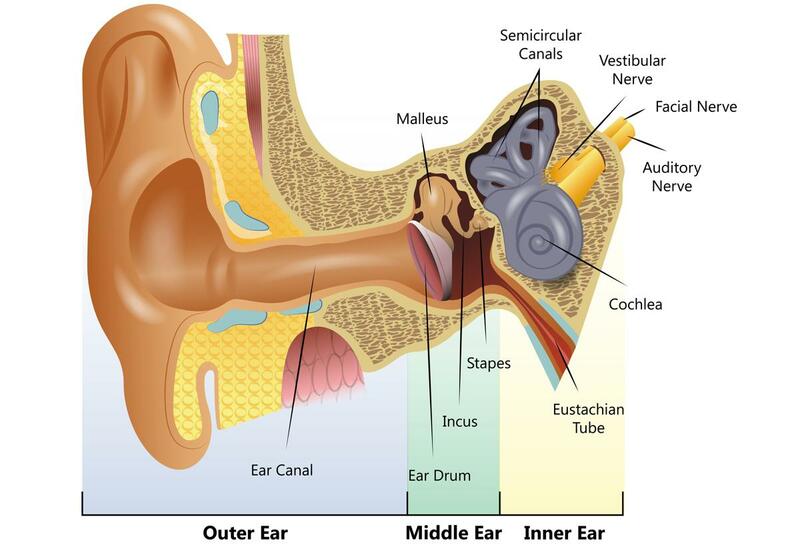 Now, let us have a look at the functions of the ear, in a little detail. The pinna and the ear canal deliver the sound waves to the middle ear. Foreign bodies like insects, dust, etc., are prevented from gaining entry into the ear due to the presence of wax and hair in this region. This helps in preventing many ear infections. The eardrum vibrates according to the frequency and the amplitude of sounds that strike it. The middle ear function of human ear is to transmit and amplify the sounds vibrated from the eardrum towards the oval window. It also acts as a dampener to loud sounds that may damage the cochlea. The round window is a flexible membrane present at the opposite end of the fluid filled channels from the oval window. The round window function of human ear is to keep the cochlear fluids contained within the scala vestibuli and scala tympani. It also functions as a multiplier of the sound waves generated from the oval window membrane. The malleus transmits sound vibrations from the eardrums to the incus. The incus transmits the sound vibrations to the stapes. The stapes transmit the vibrations to the membrane of the inner ear present inside the fenestra ovalis. The semicircular canals function is to maintain the balance by responding to gravity and the acceleration changes of the head. The mastoid bone acts as an amplifier of certain sounds that are in the low-frequency range. The cochlea, the actual organ that helps in hearing functions as a sound wave interpreter and converter. The sense of equilibrium is controlled by the vestibular system. This system is present in the inner ear. The temporal bone space is shared between the vestibular and the cochlea. The fluids present in the cochlea are present in the vestibular. In order to maintain balance and equilibrium when standing, sitting, running, walking etc., in relation to gravity without falling over, is taken care by the vestibular system. Many other systems like vision, muscle response, help the vestibular system in performing its balancing function effectively. The utricle and the saccule of the semicircular canals lie in anatomically different planes. These planes lie at a right angle to each other. These planes each have a specific function that deals with movement, that is, up and down, side to side, and tilting from one side to the other side. These canals contain sensory hair cells and are activated by the movement of the endolymph fluid. When the head tilts to one side, the sensory hair cells send a nerve impulse to the brain with the help of acoustic nerve. The fluid in the semicircular canal acts on calcium carbonate crystals (CaCO3). These crystals shift on their sensory hair beds at the base of the utriculus and the sacculus. These impulses are stimulated by the crystals present and are processed in the brain stem and the cerebellum area, in relation to the position of the head with gravity. When the calcium carbonate crystals break off from their hair beds, they float within the vestibular labyrinth. These floating crystals cause serious balance and vertigo problems. You can see in the diagram that the external ear captures the traveling sound waves. The sound waves enter through the pinna into the ear canal. Through the ear canal the sound waves reach the eardrum. These sound waves cause vibrations of the eardrum that are passed on to the middle ear. The three tiny bones in the middle ear pass the vibrations over to the inner ear. The stapes deliver the sound waves to the cochlea through the round window of the outer part of the inner ear, called the bony labyrinth. These vibrations cause the perilymph fluid present in the cochlea to vibrate. These vibrations are picked up by the sensory hair cells, that translate it into nerve impulses and deliver it to the auditory nerve present at the base of cochlea. The VIII cranial nerve carries the messages to the brain, where it is read and translated into meaningful sounds. A human ear can detect sounds that are in the range of frequency between 16 Hertz to 16384 Hertz. The following table will give you an idea of the various sound decibels that help human beings perceive different sounds. 0 dB The lowest sound that can be heard by a healthy ear of an 18-year-old. A dog can hear sounds ranging from 67 Hz to 45000 Hz. This helps it hear a dog whistle which even humans can't hear. A bat can hear up to 110000 Hz that helps it in echolocation, enabling it to fly through pitch black nights! People living on country sides have been away from loud noises of machinery and other loud sounds, have been known to be able to hear the random motion of air molecules, that bounce against their eardrums! Ear is a very sensitive organ and needs to be protected from damage. Never ever use pins or pencil points etc., to clean your ears. Use cotton ear buds for cleaning ears, or you can end up damaging your eardrums. Stay away from loud sounds and if you work around heavy machinery that creates a lot of sound, make sure you wear ear plugs to protect the sensitive eardrum. If the eardrum is damaged it may result in hearing loss. Our ears help us understand the words of people around us, enjoy music, hear our children laugh, and even help us hear ourselves. Thus, make sure you stay away from sounds that damage hearing and do not make loud sounds that may damage someone else's sense of hearing. If eyes are the windows to the soul, then ears are the doors to the mind. Without ears, you will plunge into the dark world of silence.